We suggest speaking to a Microbiome Insights representative to better understand the differences in sequencing methods best suited for your study. DNA is extracted from samples using the Qiagen MagAttract PowerSoil DNA KF Kit (Formerly MO BIO PowerSoil DNA Kit) optimized for the Thermofisher KingFisher robot. This kit uses magnetic beads to specifically capture DNA while excluding organic inhibitors. In-house testing has shown this kit to have a good balance of DNA yield and quality as demonstrated on a variety of environmental sample types. DNA quantification and quality checks are done via Qubit. We use the high-fidelity Phusion polymerase for amplification of marker genes. If extractions contain some carry-over inhibition or a high concentration of DNA, typically we test 1:1 and 1:10 dilutions and run the PCR products on gels for verification. PCR is done with dual-barcoded primers (Kozich et al. 2014) targeting either the prokaryotic (16S V4, V1-V3), eukaryotic (18S), fungal (ITS2), or archaeal (16S V4-V5) regions. Our barcoding strategy enables multiplexing up to 384 samples per run. PCR products are verified visually by running a representative subset of samples on a gel. Samples with failed PCRs (or spurious bands) are re-amplified by optimizing PCR conditions. The PCR reactions are cleaned-up and normalized using the high-throughput SequalPrep 96-well Plate Kit. Samples are then pooled to make one library that is quantified accurately with the KAPA qPCR Library Quant kit. Library pools are sequenced on the Illumina MiSeq using the corresponding primer sets for either prokaryotic (16S V4, V1-V3 ), eukaryotic (18S), fungal (ITS2), or archaeal (16S V4-V5) regions. Our bioinformatic pipeline can accommodate for flexible experimental design as a result of our expertise in biostatistics. We have the capacity for microbial marker discovery and machine learning based modeling. Our main pipeline uses Mothur (Schloss, 2009) for processing amplicon data. We also have experience working with DADA2 and QIIME. We deliver a fully comprehensive bioinformatics report with associated raw fastq files. Standard bioinformatic reporting includes plots showing taxonomic composition, alpha diversity, beta diversity (ordination), differential abundance testing, and multi-variate analysis (permutational analysis of variance). This package also includes raw bioinformatics outputs (OTU table, taxonomic classification of each OTU), differential abundance results, and relative abundances of taxa at various taxonomic levels. From point of initial contact to final bioinformatic report, I was thoroughly pleased with the amplicon sequencing and bioinformatics services provided by Microbiome Insights... the flexibility and willingness [of the team] to personalize the final bioinformatic report according to my needs was extremely helpful. Which amplicons do you run? 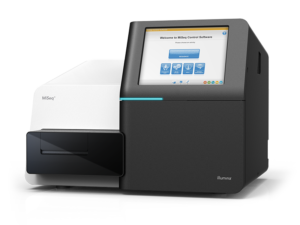 We can address taxonomic profiling for prokaryotic communities (16S V4, V1-V3 or V4_skin), eukaryotic communities (18S), fungal communities (ITS2), and archaeal communities (16S V4-V5) on the Illumina Miseq using the version 3 chemistry. Why do some labs select other primers? V1-V3 may produce better classification for skin microbiota; conversely the V4 region is less suitable for amplifying skin taxa and classification. The V4 region however produces an amplicon length that is more suitable for short-read sequencing, which reduces sequencing error. How many reads do you get per sample? The average number of reads per sample is close to 15-20K (pre-filtered). Most manuscripts tend to report pre-QC number of reads which will always be reduced after cleanup. The number of reads is driven by the number of multiplexed samples and the Miseq chemistry. We also recommend against over-sequencing as it inflates the number of spurious OTUs. The more reads that come out of the sequencer the more likely those reads will create spurious OTUs. We would also not toss out samples with low reads as there are likely biological factors at play. Course-grained comparative analysis (ex Beta diversity) are relatively robust to low reads.